Made in New England: Fire Cider, Apple Cider Vinegar Tonic, Unsweetened, Natural Detox, Pure & Raw, Certified Organic Ingredients, Honey Free, Ideal For Cleansing Diet, No Heat Processed, 32 Shots, 16 oz. Fire Cider, Apple Cider Vinegar Tonic, Unsweetened, Natural Detox, Pure & Raw, Certified Organic Ingredients, Honey Free, Ideal For Cleansing Diet, No Heat Processed, 32 Shots, 16 oz. Fire Cider starts with Apple cider Vinegar, lemons, oranges, onions, ginger, garlic, horseradish, habanero pepper, and turmeric. Steep six weeks. No heating is involved so the unique properties and delicate flavors of the ingredients are preserved. 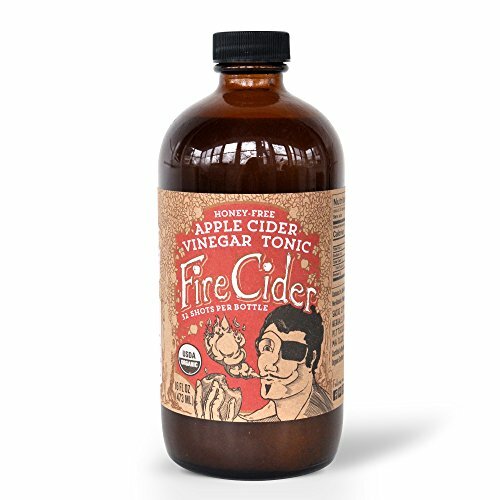 Fire Cider is made with Organic vinegar, fruits and vegetables. Recommended a table spoon everyday as dietary supplement. Try straight from the bottle; with juices, soda water, or tea; in salad dressing; or in a fierce Hot Toddy.